The cost-effective receipt printers of the MZ series offer every advantage that come with all mobile Zebra label and receipt printers. Due to its excellent price-performance-ratio, the MZ family is at the top of the low-budget market segment. Use 802.11b/g, Bluetooth, IrDA or USB to connect to a handheld or smartphone device and produce crisp, clear, printed output. 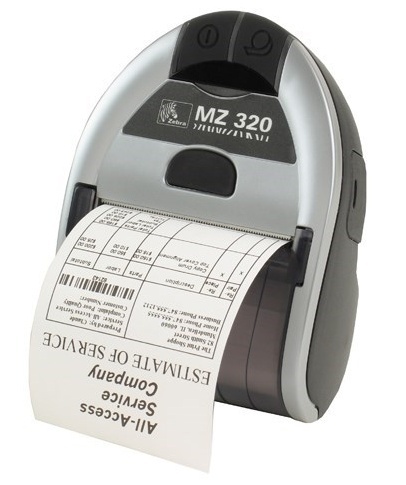 User-friendly and perfect as entry-level printers, the MZ series is the right choice for all users who need mobile receipt printers to replace hand-written documents, pre-printed receipts or unreliable printers. Employees on the road gain worldwide from the practical features the MZ series has to offer - reliability, performance and ergonomics are guaranteed. You can use the MX series printers for all fields of application, like sales, mobile points-of-sale, and ticketing or administrative applications, such as parking lot control. Optional interface versions give you the flexibility to connect to hand-held, smart phone or MDE devices and produce extremely sharp receipts or vouchers with a resolution of 8 dots/mm 203 dpi.